First, place your first finger at 5th fret of the thickest E. Now strike both the E and A strings. Now tune E to make them sound same. Now press the 5th fret of string A . Then strike both the A and D strings and tune A so that both strings sound same. If so then you are going correct. You have to follow this procedure until the the thinnest string E. Still, i am defining every step for beginners. Now to repeat the process hold the 5th fret of D string and then strike both D and G strings and tune the D string until which you get the same sound. Strike the strings continuously. Do the same for these last three strings except the B string. 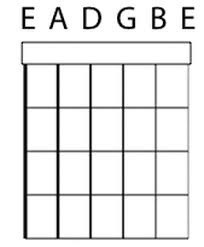 Here, you have to put your finger in the 4th fret. In this process you have to choose any two strings and hold the 5th fret of the upper one then strike the both and tune the upper on to get the same sound. Thank you very much. Hope this gives you a good result.